London's air pollution is responsible for nearly ten thousand deaths each year and is considered a major health crisis, costing our economy around 3.7 billion pounds every year. In 2016, it took some areas of London only one week to reach their annual air pollution limit and the UK has been in breach of EU Nitrogen Dioxide limits for five years. Therefore, Transport For London (TFL) asked the service designer do provide the sustainable solutions to save London. Based on the desk research that we did, we integrate the following information on a map. We tried to explore the field’s system of interactions and map the stakeholders that operate within it. Primarily, we tried to delve into the users’ world to develop a deep understanding of their needs and behaviour. We mapped out and understood existing user journeys for potential target commuters and identify problems and opportunities that exist within these current experiences. We built the user journey for the parcel receivers and also the delivery drivers to have a comprehensive understanding of the logistic use. Applying the information from the "Pain- Gain Matrix" into our logistic map, we could make sure our service whether can be the "pain reliever" and "gain creator". It also helps the team to build the value proposition. In this stage, we deployed a number of visualisation techniques to prototype and test with users and stakeholders. The narrative, story and visual/interactive proposal are designed to communicate the service proposition for our target audiences. We also designed the business model that demonstrates that the service could be commercially feasible, either through return on investment or return on social capital. Furthermore, , we participate in the RCA Progress show, through the show, we would like to generate greater awareness, encourage people and organisations to change their behaviour and offer more sustainable transport choices to positively impact London’s air quality. Factory NextGen aims to help struggling SME manufacturers innovate by providing the digital solutions and connecting them with the younger generation. This project provides an online and offline platform for the old and young to exchange skills and ideas, and develop solutions to restore the SME manufacturing industry to its former glory. Desk research is conducted to gain a comprehensive understanding of the past and future of SME manufacturing in Taiwan. This includes reviewing the history of the Taiwanese manufacturing industry and reports of the Taiwanese economy, and identifying contemporary trends in SME manufacturing from news articles. In addition, in-depth interviews are conducted with more than 40 stakeholders, including factory technicians, students, teachers, and industry specialists in government. The interviews serve to provide first-hand understanding of the current manufacturing ecosystem and identify gaps in communication between stakeholders. During this stage, solutions are developed and tested with key stakeholders. Key activities include running workshops at the factories with factory technicians, teenagers and millennial professionals, and setting up a project blog to generate interest, ideas and feedback. At the same time, key concepts and prototype solutions are tested with stakeholders. After refining and testing potential solutions, a pilot version of Factory NextGen is launched in New Taipei City with 6 factories. Most of the materials required are contributed by participants. “ Through the conversations with the young people, I felt that my skills and experiences are valued. These old machines can do much more than making clothes! “ - Liang-Chuan Chen, the owner of Chia-Shin Knit Wear Ltd. 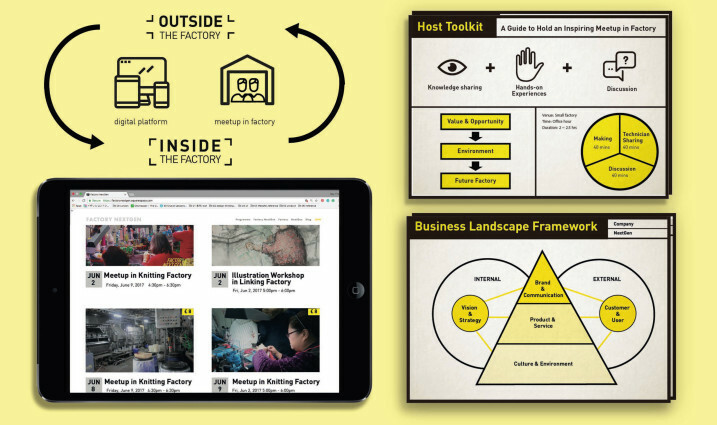 Factory NextGen helps the small factories to explore opportunities for business transformation and turns dying factories into powerhouses that allow hard-working younger generations to demonstrate their capacities and implement their ideas. Currently, this project is being implementing with 6 small textile factories in New Taipei City, Taiwan. One of the manufacturers, Chiao-Shing Knit Wear Ltd., launched a series of weaving classes to share their knowledge and also a summer camp clothing fair to showcase the manufacturing process. Liang-Chuan Chen, the owner of Chia-Shin Knit Wear Ltd. mentioned “ Through the conversations with the young people, I felt that my skills and experiences are valued. These old machines can do much more than making clothes! “. Through offering transparency of the realities of small manufacturers, the general public can take the conscious actions based on the understanding of the manufacturing process. In the past one year, more than 100 teenagers and young professional has joined the workshops in factories and also provide the innovative ideas for business transform and positive feedback. Yu-Chen Chen, the secondary school student excited about experiences inside factories. “ The programme gives us an opportunity to experiences the world outside the classroom and it was fun! We learnt more in the factory than sitting inside the classroom. ” . Last but not least, this service re-build the relationship between the factories and the communities. We also empower the local small factories to secure the local supply chain for sustainable manufacturing and provide job opportunities to contribute in local economy.